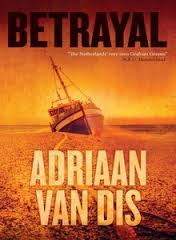 Although Adriaan van Dis is a Dutch author of some repute, Betrayal is only the third of his novels to appear in English. I picked it up at the Edinburgh Book Festival on the strength of its translator, Ina Rilke, who has previously allowed me access to Dutch writers such as Otto de Kat and W. F. Hermans, and because, as I held it in my hand, Van Dis himself appeared in the bookshop – it seemed like fate. He finds the present-day country just as segregated as it was 40 years ago: in the coastal village where Donald lives, the whites live on the dunes above the shacks of the black population “in high-walled villas…with electrified fencing glinting in the sun.” Crime is a constant threat – Mulder is advised to keep anything valuable in his washing machine. Many of the young men, with little else to do, are addicted to crystal meth. Donald, on the other hand, feels that Mulder’s time in South Africa was simply an adventure, a diversion. Both, however, focus their attentions on a young man, the son of a local prostitute, who they feel has promise despite his drug addiction. They take Hendrick into Donald’s house and attempt to cure his addiction together. Here, in microcosm, Van Dis explores then issues of white ‘meddling’ in an attempt to improve the lives of the majority of the population. This small-scale intervention is one of the ways Van Dis is able to add depth to his exploration of the problems of modern South Africa in what is a relatively short novel. He also benefits from having two protagonists, both hoping for a better South Africa but coming at the problem from different directions, something that creates tension between them throughout. The novel offers us no easy answers, only uncomfortable questions – questions that apply to all well-meaning interventions. It seems a pity that its publication has so far gone largely unnoticed. This entry was posted on September 12, 2013 at 10:43 am and is filed under Adriaan van Dis. You can follow any responses to this entry through the RSS 2.0 feed. You can leave a response, or trackback from your own site.